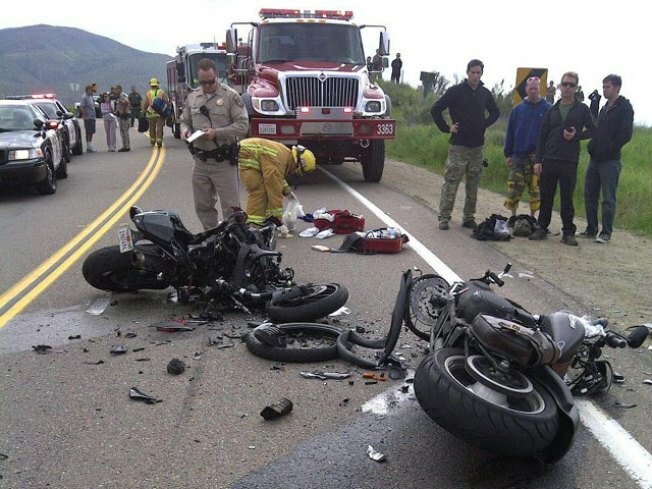 On January 30th 2011, at 11:02 CAL FIRE/Rural Fire Protection District engine companies responded to multiple motorcycles down West of the Otay Glider Port on Otay Lakes Rd. Upon arrival two motorcycles where found to have collided head on. Unfortunately one patient was pronounced dead on scene. The second patient who suffered arm and leg fractures was flown to Sharp Memorial Trauma Center by Mercy Air. CAL FIRE was assisted by the Chula Vista Fire Department Engines 56 and 58 along with AMR medic units 412 and 420. An active duty sailor was killed in a motorcycle crash in Chula Vista Sunday. Authorities say the 22-year old motorcyclist was trying to pass another group of bikers at Wueste Road and the Divider Creek Bridge, east of state Route 125 when he collided with a Harley Davidson. The sailor was wearing a helmet and driving a Yamaha R1 when the crashed happened just before 11 a.m. Despite CPR efforts, the man was pronounced dead at the scene. The Harley rider suffered a broken arm and a broken leg, according to firefighters, and was airlifted to Sharp Memorial Trauma Center. The medical examiner confirmed the victim in the accident was an active duty sailor but would not release his name.